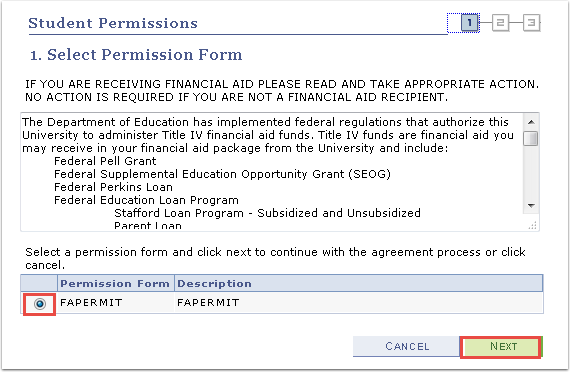 Purpose: Use this document as a reference for how students can grant permission to apply payments, financial aid, etc. to charges other than allowable charges or charges in other terms in ctcLink. Under the Finances area, click the Payment Profile link. Select the Account Services tab. Click the Student Permissions tab. Click Grant Permission. After reading the description of the permission form, verify the FAPERMIT is selected. Click Next. After reading the authorization section, Select Yes, I have read the agreement. Click Submit. You should see a green checkmark once the form has been submitted and accepted. Click View Student Permission to see it assigned to your account and to go back to your self-service account. To view the agreement again, click Display Student Agreement. Click Return to go back to you student self-service account.